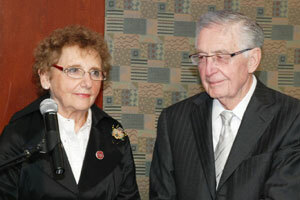 This past November, the Ramapo College Foundation gratefully accepted a gift of $2 million from Bergen County philanthropists Myron “Mike” and Elaine Adler of Franklin Lakes, NJ to establish the Adler Center for Nursing Excellence. The gift will fund the new home of Ramapo College’s highly-acclaimed and expanding Nursing Programs, as well as state-of-the-art labs to enhance the education of all science students. The gift will launch a $54 million renovation to the College’s G Wing, which houses the School of Theoretical and Applied Science and the School of Social Science and Human Services. “Well-educated nurses are the backbone of our society,” said Elaine Adler. “Mike and I are privileged to be able to help future generations of nursing professionals and prepare them for the challenges that face our region, state and country.” The Adlers have been consistent supporters of Ramapo College for more than 20 years. Mrs. Adler is a member of the Ramapo College Board of Governors and the couple has provided numerous gifts to support the College’s Annual Fund, student scholarships, the Gross Center for Holocaust and Genocide Studies, the Distinguished Citizens Dinner, the Golf Outing, as well as a capital gift for the Adler Theatre in the Berrie Center for Performing and Visual Arts. Robert and Nancy Kossowsky have embraced Ramapo College’s initiatives to create a more sustainable campus. The Upper Saddle River couple recently made a gift to support an organic garden as a central feature of the Sustainable Agriculture class offered by the School of Social Science and Human Services at the Sharp Sustainability Education Center. The gift provides funding to procure a shed, fencing, an irrigation system, plants and supplies to establish the sustainable vegetable garden on the site. Mr. and Mrs. Kossowsky have also demonstrated their support by establishing the R and N Family Scholarship to recognize students who are active in their community and who have financial need. This endowment also recognizes the positive experience their son, Jacob, had as a Ramapo College student. 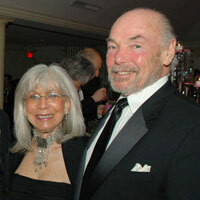 The Kossowskys have given their support to a number of Ramapo College initiatives including the Salameno Spiritual Center and the Havemeyer Edible Garden. Jacob, who graduated in 2010, is following in his parents philanthropic footsteps. He established the JDK Scholarship for students who transfer to Ramapo College from another institution of higher learning. Every life has a story. And for Sofia W. Dembia, her story is one imbued with a rich connection to her Polish heritage and lifelong ties to Mahwah, NJ. She married Edward Dembia, who shared her Polish ethnicity, in 1945. Together they built their married life and maintained ties with Poland though their church. They traveled to Poland numerous times and hosted relatives visiting from that country. During Poland’s Communist rule, the Dembias sent packages containing hard to find items, and later, money, to relatives. Mr. Dembia worked for Maxwell House Coffee; he died in 1988. Mrs. Dembia worked as a legal secretary. She then obtained New Jersey real state and insurance licenses and owned Ramsey Interstate Realty and Insurance. Upon her death May 22, 2010, at the age of 93, Mrs. Dembia established a scholarship at Ramapo College in memory of Edward and herself. It was her wish that preference be given to Polish-American students or those who have an interest in Polish culture. Respectfully and gratefully, Ramapo College will carry out her request.